Brewers: Gomez 8, Morgan 9, Braun 7, Ramirez 5, Gamel 5, Kottaras 2, Conrad 4, Izturis 6, Narveson 1. 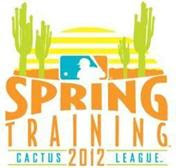 STRANGE BREW: Today is the first of three Cactus League games between the Dodgers and Brewers. Following this afternoon’s tilt, the two clubs will meet on Sunday in Maryvale and on Friday, March 30 at Camelback Ranch – Glendale. During the 2012 regular season, Los Angeles visits Milwaukee on its second road trip, beginning April 17. 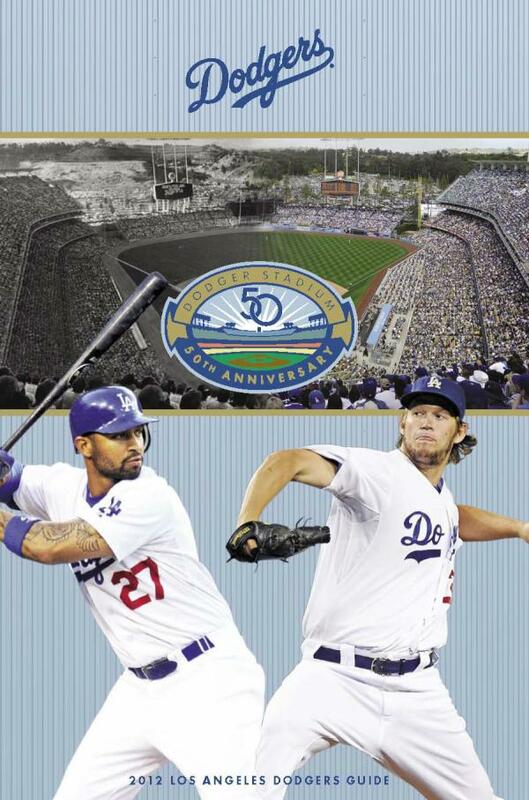 The Brewers make their annual visit to Chavez Ravine from May 28-31 this season. ● RHP Josh Lindblom, who tossed a scoreless inning Saturday night and now has a 3.86 ERA (2 ER/4.2 IP) in four appearances this March. ● LHP Wilfredo Ledezma last pitched in a game on Friday, working a scoreless inning against the Rangers. Ledezma has allowed just one run over 4.1 innings this spring. ● RHP Ronald Belisario fired a scoreless inning Saturday night and will make his fourth appearance. ● RHP Ramon Troncoso has yielded just one run over 4.0 innings this spring, including three consecutive scoreless outings. 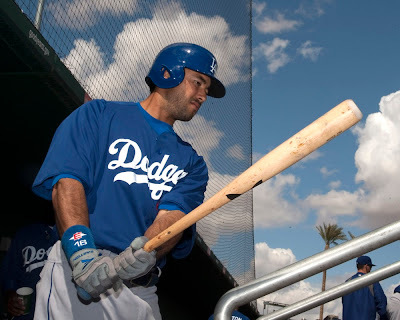 The native of the Dominican Republic made the Dodgers’ Opening Day roster from 2008-10. A FAMILIAR FACE: The Dodgers would like to welcome former shortstop Cesar Izturis to Camelback Ranch today. Izturis played in Los Angeles from 2002-06 and made the NL All-Star team in 2005. The native of Venezuela won a Gold Glove following the 2004 campaign and was a big part of the 2004 NL West champs. Izturis is looking to make the Brewers as a non-roster invitee following three seasons with the Orioles. ON THE SIDE: Dodger relievers Javy Guerra and Scott Elbert appeared in a game yesterday and will work their first “back-to-back” today, facing live hitters on Field 2. In addition, infielder Jerry Hairston Jr. will play a game on the minor league side. MOVING ON: The Dodgers lost just their second road Spring Training game yesterday, falling to the Indians in Goodyear, 4-3. Infielder Justin Sellers continued his hot-hitting spring, going 3-for-4 with a double, an RBI and a run scored. Sellers is now hitting .385 (10-for-26) and his seven RBI are tied with Juan Rivera for the team high. On the mound, starter Clayton Kershaw went 5.1 innings and allowed just one run while striking out five. Kershaw’s first earned run of the spring caused his ERA to climb to 0.73. ● Los Angeles’ four draws this spring tie for the second-most all time by the club along with the 2002 and 2008 campaigns. The Dodger record for Spring Training ties was set in 2006, when the team went 15-13-5. GOLDEN CACTUS: The Dodgers enter play today with the third-best record in the Cactus League with an 8-5-4 mark, trailing the Athletics by 3.5 games and the Giants by 1.5 games in the standings. Los Angeles has the second-best team batting average among National League clubs this spring with a .283 mark and its 3.39 team ERA ranks third. The Dodgers are tied with St. Louis for the top NL on-base percentage with a .356 mark. Individually, Andre Ethier leads all National Leaguers with six doubles and leads the team with a .455 batting average (10-for-22) and a 1.045 slugging percentage in 10 games. BREAK A LEG: The Dodgers would like to welcome former pitcher Ralph Mauriello to the ballgame today. Mauriello, 77, will sing the National Anthem before today’s contest. TUCSON TUSSLE: This Friday, the Dodgers and White Sox will play a Cactus League game at Kino Veterans Memorial Stadium in Tucson with all the proceeds going to the Christina-Taylor Green Memorial Foundation. The Christina-Taylor Green Memorial Fund was established by Dodger scout John Green and his family to honor the life and memory of his daughter, Christina-Taylor, through charitable and educational projects that reflect and embody her interests, values and dreams. 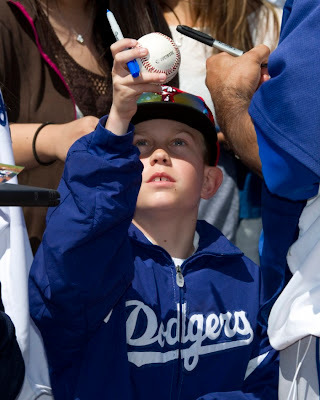 This is the second straight year that the Dodgers have played a benefit game in Tucson to help raise funds for the victims and families affected by the tragic events of January 8, 2011. ● The Dodgers also play a split-squad game against the Royals in Surprise on Friday, but the majority of the club’s regulars will head to Tucson with Matt Kemp, Andre Ethier, Juan Rivera, Mark Ellis, A.J. Ellis, Dee Gordon, Tony Gwynn Jr. and Jerry Hairston Jr. volunteering to play in the benefit game. Available in Lew Lipset's Old Judge.com auction are a group of 8 photographic snapshots from Ebbets Field. I know that doesn't sound like much considering there are thousands of pics out there from its nearly 50 years of existence. 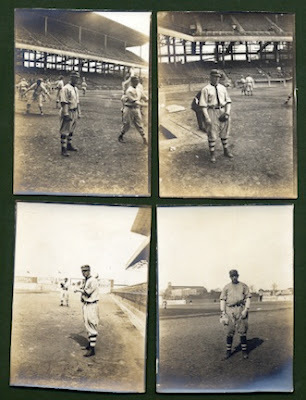 What makes this photos special is that they apparently come from 1913- the year Ebbets Field opened. On top of that, one of them has been dated on reverse as April 7, 1913. This is two days before its officially opening in Brooklyn. The photos measure about 4 1/2" x 3". According to the writing on the back, they were taken on April 7 (Daubert), May13 (Cutshaw, Hummel), May 15 (Smith, Stengel), May 16 (Miller). The photos of Wheat and Rucker are undated. It’s interesting to note the pictures have almost all different parts of the ballpark in the background. 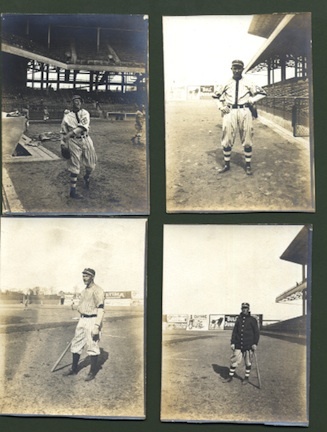 The opening bid for these photos is steep- at $1500.00. So, I won't even think about bidding. It's way over my budget. Still, I'd love to have a closer at these beauties.